Our trash bins are perfect for outdoor settings. Tuck them away or let them blend right in next to wicker furniture. Free Shipping on all orders! 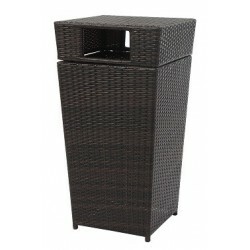 Beloved by architects who design contemporary hotels, restaurants and grand outdoor spaces, this modern outdoor wicker 18.5 liter trash bin upgrades any outdoor space. Designed in a neutral brown hue, its push door ensures unpleasant odors are discreet. 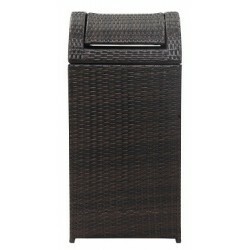 Designed for the needs of the contemporary tastemaker, this outdoor wicker 18.5 liter trash bin is ideal for entertaining. Its sleek and durable brown wicker construction is a timeless investment, and disposal is easy and discreet with its open top.